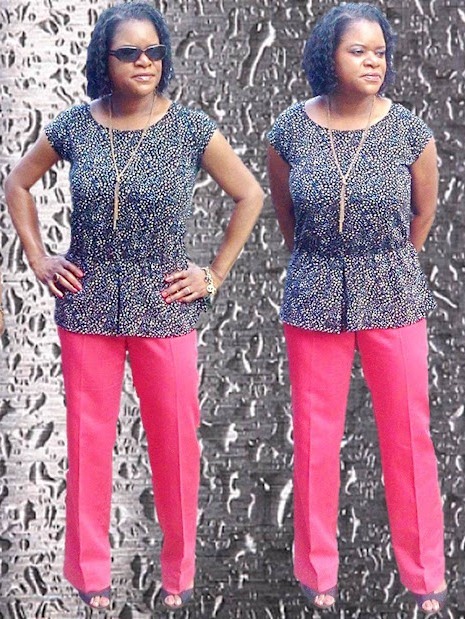 Butterick 5709: Pullover, blouson top has extended shoulders, elasticized, seamed waist and narrow hem. A and B: loose-fitting. B: handkerchief hem. C and D: very loose-fitting, bias, mock wrap front gathered into forward shoulder seams. D: self belt and elasticized sleeve hems. Purchased camisole, belt and bias tape to finish necklines and armholes. Construction: Created a center back seam (which I forgot to mention I did with the previous ones), inserted a 6" zipper at center back, stay stitched the neckline, serged seams, serged neckline and fold a 1/4" hem and final stitched, as well as serged, fold a 1/4" hem and final stitched the armholes and hemline. However, this time I added 1/4" clear elastic to the waist seam minus the casing and totally love it. Used another printed polyester georgette fabric (black base with beige/white circles) purchased at Fulton Fabrics. Two-n-half months ago, I caught the all time sale at the Loft, seriously 6 pairs of pants just under $55.00 straight off the clearance rack. When I said an all time sale... 3 pairs of jeans were $4.88/each... totally scored, two dressy slacks $9.88/each, and red pants were $19.88. There was a big sign announcing 40% off discounted items, of course with my armload of pants, I was expecting 40% off my discounted load. When she totalled the amount, I immediately asked about the 40% off and she gave me a.... are you serious... I mean serious.... I of course, gave her a straight face and said serious as the day is long... whaattt!. Well, she blah...blah... blah about items marked $__.88 do not qualify for the 40% off. I asked to see a manager and she confirmed it.. oh well... paid for my items totaling just under $55.00 and headed out the door. Great looking top and WOW, what a buy on all the pants. Loft has the best sales. Thanks Lori, the Loft has great sales and the trick is to drop in often. Great deal on pants. I never sew them; can't face up to the fitting issues. Also: CUTE shirt! Thanks Adelaide, I've sewn a few pants, but if I can catch them at a good price, I will buy over sewing them. Great top - very fun with your ridonkulous sale pants! Now that's how you shop! Love those kinds of deals! Your top is fabulous....just fabulous! Thanks Clio... I like that term ridonkulous..
Great shirt. I have that pattern and it is already cut out. Don't have a clue what I am waiting for...May have to make it this weekend. Those types of sales are the only reason I would spend my money at the stores. Great deal! Love the top, Sheila. And who could pass up a deal on well fitted pants. Great looking outfit. NICE! You definitely have to speak up when you know you're right, especially when money is involved! Great work on your top too! People think you have to be rich to wear Ann Taylor clothes; not true! We have an outlet type store in the next town and I've gotten tops and sweaters for as little as $3. Just have to watch the clearance racks. Great buys at the Loft. Love the new top and the pants is awesome, especially the color. Another rellay cute top that looks great on you!